Spring 2018 Mug Exchange ~ Such A Beautiful Blessing! "As cold waters to a thirsty soul so is good news from a far country." It was such a pleasure and blessing to be able to participate in Stephanie's Mug Exchange once again. I look forward to it so very much, and this time surely did not disappoint! I sent to a precious, dear lady who is also named Cheryl S., and she and I have been enjoying some wonderful email exchanges. We are getting to know one another, and I have truly gained a new friend! I had such a wonderful time shopping for her and putting her things together. She has a lovely, interesting genealogy blog called 2 Sides of the Ocean. The sweet lady named Allison who sent a package to me could NOT have done a better job! This is what I saw when I first opened her thoughtfully wrapped and packaged box. Of all of the amazingly beautiful colors God created, lavender is my dearest favorite, hands down. So, you can imagine how much I "oohed" and "ahhed" over this beautiful, feminine, dainty, lavender-flowered box with a lavender bow. I placed it on an old, antique quilt to take the next picture. This quilt is a cathedral window pattern. It was made by an elderly banking customer of mine who became a personal friend. It isn't finished, but she gave me the part she had completed, and I have cherished it ever since. I have it hanging over an old-fashioned military trunk in our living room. Every time I look at it, I have no choice but to feel happy inside. This little gem of a box looked so pretty sitting on it, but it didn't stay there long. I moved it up to our bedroom where we have a lavender quilt and shams, and it blends in perfectly! As if the box isn't pretty enough all on its own, just wait until you see what I saw when I lifted the lid! A precious, little, dainty mug, with a coaster, and the prettiest, little ceramic spoon you have ever seen!!!!! After I finished admiring these beauties, I found the most wonderful surprise! Not one....not two....but THREE bags of COFFEE!!!! And, this is not just any coffee, let me tell you. Anyone who knows me knows that I. LOVE. COFFEE. But, in all my years of sipping coffee or enjoying it poured over ice, I have NEVER, and I do mean, NEVER, tasted anything like this coffee. This coffee is ground finer than any I have ever seen, and the aroma is POWERFULLY, amazingly wonderful! That's all well and good, and I may or may not stand over the open bag inhaling profusely and lingeringly each and every afternoon as I am filling up my Keurig basket with these delightful grounds. BUT, the aroma has nothing whatsoever on the taste! If you love coffee, you simply MUST order some of this stuff from The Spice Merchant! (If you order, there are several choices as to how you want it ground. Allison chose the "drip" option for mine, and it is absolutely perfect! First of all, she sent me a flavor called, "Jamaican Me Crazy". This stuff....oh, my, where do I begin...there are no words....they fail me. Then there is the "French Vanilla"...need I say more about that? Then, I came across this gem...pure delight in a clear, cellophane bag!!! As I continued to dig, I found the neatest keychain I think I have ever seen! It is a high-quality, heavy, very well made, little acoustic guitar replica!! a musical note bookmark, and a neat little journal that says "Thoughts for the Day." Enough to last for a long while. Allison really, really put her heart and soul into this precious package, and she was oh, so generous to me! I cannot thank her enough for her kindness. She truly went over and beyond, and she will never know how much she made my day days, as the gifts just keep on giving each time I open one of these wonderful, aroma-filled bags to make a cup of coffee. God bless you, again and again, Allison! And, God bless you, sweet Stephanie!!! I am so very thankful for the time, energy, and love you put into organizing and hosting this wonderfully blessed exchange for all of us!! I truly had so much fun and am so grateful to you both!! Cheryl: Please tell us about yourselves. Sherry: Well, where do I start? I grew up in a musical family from Moneta, VA (Smith Mountain Lake). My dad was the music director and my mom the children's choir director. I have an older sister who plays piano and a younger sister who plays anything she wants but is a professional drummer, and I play the piano. My family began traveling and singing when I was 8 years old, and I have been in southern gospel music since then. I met Eddie at a Hinson's concert in Pulaski, VA, in January 1984, where his group was hosting and my mom and I attended with some friends. We married 8 months later. After we married, I went from traveling with my family to traveling with him and the group he was with. We have traveled and sung with a few other groups since then, but primarily on the weekend because we all worked full-time jobs. Eddie grew up in Radford, VA. His mother was a saint if there ever was one and his dad, a hard-working man who worked 3 jobs to care for his family of 6 children, so their mom wouldn't have to work outside the home. He began singing early in life also but in the secular field until he was about 28 years old. We have a son who spent 11 years in the Marine Corps and now works for the Naval Shipyard in Newport News, VA. We have 3 grandchildren. 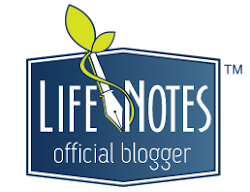 Cheryl: Can you share your testimony of how you came to be full-time RVers? Sherry: In January of 2016, we were living a very comfortable life when we received less than 24 hours notice that our sole household income was being eliminated. Now, this wasn't just a little income that we could easily replace. Eddie was a VP with a finance company for almost 15 years and was making a generous six-figure salary, had a company car, company insurance and gas card, a company phone and a company computer and we lived in a beautiful 3 bedroom, 2 1/2 bath condo in a lovely neighborhood where we had wonderful neighbors and friends and a great church family. We were, as I said before, very comfortable — however, we were also very complacent. So God decided to put us to the test, so to speak, to see how much we trusted Him. When we received this news of the loss of Eddie's job on a Tuesday, it was interesting really, that we never panicked. See, we had enough experience by then to know that God had provided that job, and He would provide the next one. I won't go into the details of finding out about the next "jobs." I will just say that by Friday, we were both offered positions to sing Christian music full time as cast members at the Biblical Times Theater in Pigeon Forge, TN. We were very excited but very sad at the same time, as in what seemed like a moment's notice, we had to leave our place of comfort, including our church family, our friends, and our family to be ready to start work at the theater 3 days later. This was a 6 day a week commitment from February 1 til December 31. Though we were in a new town alone and terribly homesick, we knew this had all been God-arranged. We share the details of the many things God arranged in our live testimony including how He sold our home in 2 weeks within $2,000 of our asking price when 5 other homes in our circle had been on the market for at least 2 years and had not even had an offer, and how He provided a long-term campsite in a much-desired campground in Pigeon Forge that now has a 5 page waiting list for a long-term spot. At the end of the year, when it came time to resign or re-sign our contract at the theater, we began praying about what God would have us do, as we had many signs that led us to believe that God may have been using the theater as a stepping stone into a full-time ministry on the road, once again putting us in the position to step out on faith. After much prayer and discussion, we knew what we were supposed to do. Understand that God had put a desire in our hearts not to entertain, but to minister to the lost and to encourage the saved to keep pressing on, as time is short. During the year we were at the theater, God arranged our meeting of a Christian couple who were full-time RVers. They came to the theater one night to see the show and during our conversations, they mentioned to us that we needed to be out there ministering on the road. They also shared information about their lives as full-time RVers. See, we had bought a camper less than a month prior to Eddie losing his job, not knowing any of this was going to happen and we were staying in it until we could find a more permanent place (we thought). Through our conversations and our seeking God about staying or leaving the theater, we knew that the education we received about living on the road in an RV was not by chance. In January 2017, we stepped out on faith and put our ministry back on the road. While we have been working to build our ministry schedule back, we have worked at various places part-time to supplement the ministry's income. Cheryl: What are some of the most challenging things about RV living? Sherry: Smaller closets are the most challenging thing for me because I love clothes, shoes, and jewelry, and less room, of course. Cheryl: What are some of the most rewarding parts? Sherry: Less to clean! LOL! Most rewarding is probably that we always have everything with us wherever we go. We don't have to pack and unpack to go on a trip and worry about forgetting something. Also, meeting other RVers. RVers are the best. They are so willing to help each other. If one doesn't know how to fix something, another one does. Eddie has gotten really good at fixing things on the RV because of fellow RVers and a facebook page called RV Tips. Cheryl: Please tell us about your minimizing journey. How difficult has it been to downsize your lives to live in an RV? Has it been your choice to keep and store your possessions or let them go? Sherry: Okay, this was a real journey. Moving in 4 days from a 3 BR, 2.5 BA condo to an RV was beyond stressful. It primarily fell on me because Eddie would have just taken what he wanted out of the house and left the rest there for the next person! LOL!. Having to figure out what to sell, give away, throw away, or keep was not fun. I struggled with a lot of guilt when I went through closets and saw all the things we bought just because we could and the money we wasted on all that stuff only for it to end up in a closet or attic. It was a real eye-opener. Thankfully, I have family and friends who saw that I was stressing over trying to get it done and jumped in and helped me sell and give away the majority. Family heirlooms were given to family or stored at my mom's. Several friends sold things online and in yard sales, and we have a 5x10 storage unit that we keep our extra clothes and shoes in, as well as a small amount of Christmas decorations and a few other things we like to have close by but can't fit in the RV full time. I must say, downsizing was the hardest part of it all. Sherry: I was saved in a revival at my home church when I was 12 years old. Eddie was also saved as a young man in a service at his home church as well and doesn't remember what age, but later in life strayed from the church. He will tell you that he didn't get serious about his walk with the Lord until he was much older. He has always gone to church, not really realizing that his relationship with the Lord was pretty casual until he went through some life-changing experiences that were a real wake-up call. Sherry: I would say, and I think Eddie will agree, that it would have to be learning to trust God and know that He's got it all, that he has always provided and always will —maybe not in the way we expect or with as much money as we would like, but He will always be there. Now we can't just live any old way we want and expect God to reward us. God's word is clear what he expects, and He knows our hearts. As long as we are doing the best we know how to represent Him to the world, He will take care of us. Sherry: As I said in the first answer, I met Eddie at a concert. I knew the other members of his group, but he was new, so I asked the lady in the group who he was, and she introduced us. He shook my hand and said, "Hi, are you married?" I said, "No." He said, "Would you like to be?" and I said, "Well, I'm only 17." He said, "That's okay." He called the following week and 8 months later, we were married. We've been married for 34 years now. Sherry: To show them Jesus, to bring them to salvation if they haven't done that, to encourage those who have, and to help people see that we need to get beyond the walls of the church to reach people because most won't come in. Sherry: Probably the most difficult was back a few years ago when we had a group that was seeing a lot of success in gospel music as far as seeing doors open and people saved. 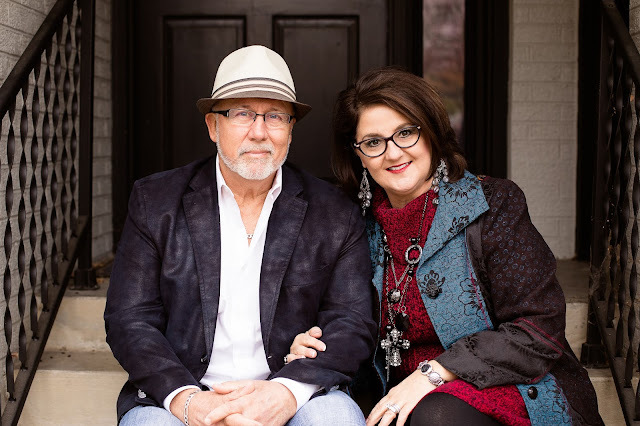 We had songs on the top 80 chart, and we were about to step out into a full-time commitment, we had been booked that year on 3 of the largest events in gospel music, etc., and the devil gradually crept in, and in a short time, managed to destroy it all. 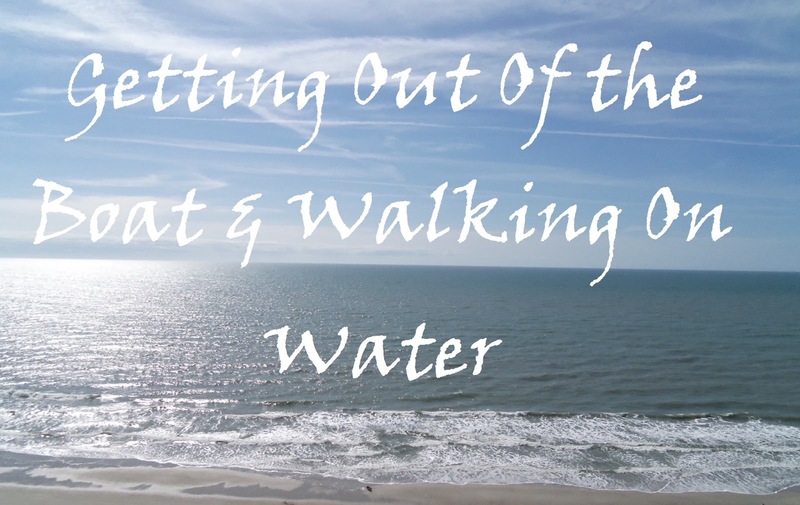 Sherry: Get serious about your walk with the Lord. Trust the Word. Don't just read it —study it and learn to use it against all that satan tries to bring against you. Get to know it so that you not only have a defense against satan but so that you know without a shadow of a doubt that you can trust God to take care of it. Find a new light and work toward it, and don't let satan have control over you or your time. If you can do nothing else, just say the name of Jesus over and over because, at the name of Jesus, satan has to flee. I used this for years. Believe me, it works. Sherry: That would probably be to stop rescuing our son every time he was in a bind. I guess we came to a place of surrender and resigned to His will when we no longer had the means to rescue him. It was hard then but now that we see how our son has grown into a Christian singer in his own right who can rely on the Lord to stand on his own, it's been very rewarding. Cheryl: What are your plans for the future of your ministry? How is He leading you? What is an as-of-yet unfulfilled ministerial dream? Sherry: Put God first, each other second, children third, and careers fourth. Pray together. Go to church together. Save yourselves for marriage. If you are afraid they will leave, they aren't the one for you. Let them leave. Discuss your goals short-term and long-term. Discuss each of your finances and how you plan to handle them after marriage. Discuss whether or not you want children and if so, how you will discipline them. Have secrets between the two of you and God that no one else is privy to. -You won't always get your way. Marriage is not 50/50. It's 100% give and 0% take on both sides. Sherry: Any way you can think of, we'll take it. LOL! Pray for safety and protection on the road for us and our RV. Almost everything we own is in it. Pray for continued good health. Pray for favor with everyone we meet and for doors to open to share our ministry. A BIG thank you to Eddie and Sherry for sharing their hearts with us here! Please keep them both in your prayers as they continue to walk this faith walk. If you would like them to come and minister at your church or event, please let them know! You can connect with them at their website, on Facebook, or you may email them at therichardsministries@gmail.com. In closing, I hope you can take the time to listen to this beautiful song. Dear friends, it is with joy and gratitude that I bring you the Inner Views of today's honored guest! I am sure many of you already know her and are familiar with her work and ministry. I trust you will be blessed by getting to know her a little better today, and if you haven't met her yet, I know you will surely find encouragement in making her acquaintance. Dr. Michelle: I grew up in a lower-middle-class family, with one younger brother. I was born premature back in the day when babies weighing less than 3 pounds usually didn’t survive, and if they did, they were generally mentally and/or physically challenged. At the age of 3, I fell prey to a life-threatening illness, and my parents had been told by my doctors that I would likely die, but if I survived, I would never walk again and have brain damage. My mother was a very strong woman and set out to prove doctors wrong. I do have a physical deformity, and never grew to be the height of my normal peers, but I can walk, and I became a doctor. As a young girl, my father died of a massive heart attack, which was very difficult for me to have lost him at a time when developmentally I needed him most. My mother remarried, I had to change schools away from all my friends and support system. Soon thereafter, the entire family moved from Michigan and all my extended family to Florida, which was also very difficult for me. Cheryl: We would love to hear your Christian testimony. What drew you to Jesus? Who has been most influential in your walk with Him? Who has prayed for you most? Who has mentored you? Dr. Michelle: I was raised in a Christian home. Every time the doors were open, we were in church. We also helped plant several churches during my childhood. So I have no memory of not knowing Jesus, although I asked him to be my Savior when I was seven years old. Even so, it wasn’t until my adult years when I fully understood the importance of making him Lord of my life and fully submitting to him. Growing up, my mother’s best friend was a beautiful woman of God who had polio earlier in her life and never had children of her own. She was a beautiful role model to me of a Christian woman. In my adult years, however, when I went through a particularly difficult season, God introduced me to an older woman who was very much like a spiritual mother to me. So much so that I dedicated my first book, “Hope Prevails,” to her. Unfortunately, she died tragically in a car accident the weekend before Mother’s Day of the year my book released, and I never had the opportunity to share my dedication with her. I have a couple very close girlfriends who are mature in their faith, who pray for me regularly. They have walked with me during good times as well as times of crises, and they have permission to always speak truth into my life. I know that whenever I say the word, and even when I don’t, they are there ready to pray. I have been blessed to have several different mentors throughout my life—professionally, personally, and spiritually. One dear friend was a mentor to me at a very pivotal time in my spiritual walk. She helped me to really see the truth for what it was and has been very supportive of me and the roles God has called me to. My spiritual mother was also very much a mentor to me, and her death left a big hole in my life, although I rejoice that she is with Jesus, and I know there is no place she would rather be. Cheryl: Can you tell us how the tragedy of losing your father so suddenly and at such a young age affected your life? If your father were alive today, what would you most want to tell him? Dr. Michelle: When my father was 40 years old he suffered a major heart attack. From that day forward, he began a rigorous exercise program, changed his diet, lost weight, and did everything doctors told him to do. Approximately two years later, he saw his physician for his annual physical and was told that he would likely live to be 100 years old. Tragically, he died of a second massive heart attack approximately two weeks later. My mother and I had been gone most of the summer, with me at a children’s hospital having significant reconstructive surgery and rehabilitation while my father stayed home to care for my brother and work. At the end of the summer, after I was discharged from the hospital, my mother and I drove through the night to get home in time for my brother’s tenth birthday dinner. After dinner, I said goodnight and went to bed only to be awoken in the wee hours of the morning to be told my father had died in his sleep. As a result of my father’s death, my first thought was “what do I have to do to support the family?” (My mother was from another country without an education or trade). My second thought was “This will never happen to me—if something were to happen to my husband, I will be in a position to support my family.” So I became more determined than ever to go to school and have a career that could support a family if necessary. My father’s death also ushered in a spirit of fear—if God would allow my father to die, I wasn’t so sure I could depend on my Heavenly Father to be there when I needed Him. It was quite a few years before I realized the lie I had believed. I can’t say that I have anything left unsaid to my father. He knew I loved him very much. If there was anything I’d want to say, it would be that I have forgiven him for dying when I needed him the most. If my father were alive today, what I’d really want is for him to get to know my children, whom he has never had the chance to meet. I think he’d be pleased with how my life and how my children have turned out. Cheryl: How long after losing your father did you find out your mother had cancer? How did you find the strength to get through a season of such enormous grief piled upon more grief? Dr. Michelle: Approximately a decade after my father died, I finished all my formal education (school, internships, fellowships) and had just settled down with my husband in our current community, when my mother was diagnosed and began treatment for lung cancer. And within months of her diagnosis, my husband was diagnosed with a very rare form of abdominal cancer and told that he only had a couple of years to live. During both of their cancer treatments, I miscarried our second baby. Grief was paramount during that season of my life. The only way I found the strength to not only face the next day but face the next five minutes was to depend on God. I look back now on that time and know that there is no other explanation. In my own strength, I couldn’t have done it. Cheryl: Can you share with us about some of the most effective ways others reached out to you during your times of sorrow? What are some things we, as Christians, can do to minister to others who are hurting? 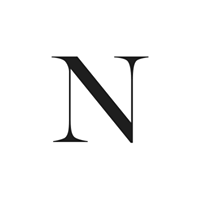 Dr. Michelle: I can tell you what not to do: don’t tell someone that if they “need anything, let me know,” and most especially do not say that if you wouldn’t be willing to do whatever the need was. Throughout our most difficult trials, we experienced both ends of the spectrum in terms of support. We had those who voiced an offer of support if we needed it, but then when the need arose, they were too busy to keep to their word. But most recently, when my husband was diagnosed with another form of cancer, God blessed us with amazing support. People showed up with groceries unannounced, people picked up our laundry once a week and returned it washed and folded, several families from my boys’ cross country team showed up either with home cooked meals or to do yard work because my husband was too weak to do it and I was too busy trying to keep all the other plates spinning to get to it. Many also sent cards, texts, or left messages praying for us. Scripture tells us to love in word AND deed. So often I think we shy away from saying anything when others are going through a challenge because we don’t want to say the wrong thing. Believe me, it’d be better to say the wrong thing sometimes than nothing at all. But the best way we can minister to others is in practical ways such as cooking a meal, running errands, providing childcare or respite care for parents or caregivers, gift cards for groceries, supplies, gas, or meals, cleaning someone else’s house, or picking up their car and taking it through the car wash. Lending a hand with yard work or carpool is so very helpful. And rather than just telling someone you are praying for them, actually, pray WITH them—this is such an encouragement and lends strength and comfort. Cheryl: How did you meet your husband? We would love to hear your love story and any challenges you have faced together and overcome. Cheryl: What life events inspired you to want to become a doctor? Will you please share with us about your journey in the field of medicine and your medical practice? Dr. Michelle: From as long as I can remember, I’ve always been one that people come to with their problems. So a natural fit for me was to go into the field of psychology. At the time, I didn’t even know that there was a specialty called neuropsychology. But once I became aware of it and started learning more about it, I knew it was an area that I wanted to pursue because the brain fascinated me. So all total, I spent approximately 12 years working toward my degree and board certification in neuropsychology, which is the study of brain-behavior relationships. While I started my career working in the hospital setting, I have been in private practice for almost 20 years now. I evaluate patients with a variety of medical and mental health conditions ranging from stroke, epilepsy, and dementia to depression, anxiety, and ADHD to help determine the most accurate diagnosis and treatment plan. I also speak and write books to share what I’ve learned to lend hope to others. Cheryl: How do you merge your faith into the way you bring about positive change in the lives of your patients? Dr. Michelle: Because of our ethical regulations, I am often limited in what I can say, until a patient brings up their faith or religion with me. Then we can have some amazing conversations. But we view my private practice first as a place of mercy and grace, hope, and healing. So as a staff, we pray for our patients every morning before the day starts, we play Christian music in the waiting room, and we pray with patients when they allow it. We want them to leave our office changed for the better, either more peaceful, or more hopeful, or having experienced mercy and grace by us, so that when they leave, they wonder what made the difference. When possible, I share with patients about the spiritual root of disease rather than just putting a band-aid on the condition. Cheryl: As you look back upon your career as a doctor, what is one of the most rewarding moments or seasons you have experienced? What fulfills you most in your quest to help the hurting? 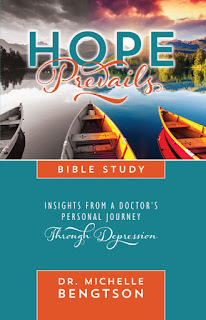 Dr. Michelle: Honestly, the most rewarding experience has been after following God’s lead to writing my book, “Hope Prevails: Insights From a Doctor's Personal Journey Through Depression” and then the companion “Hope Prevails Bible Study.” These two books have been a resource to many who could not make it into my office for help, because they lived too far away, and we have heard amazing reports of how God has used these two books to lead others to HIS help, hope, and healing. While my job title is a neuropsychologist, I truly believe my call is to be an encourager. So everything I do, whether it’s in my private practice, or in the blogs I write, or social media posts, books I publish, or speaking engagements is always with a goal of providing help, hope, and encouragement to those who need it. Cheryl: To the reader who is now walking through an unbearable season of grief, what would you like to say? Dr. Michelle: First, I’d say I’m so sorry. I understand, and I know how painful and hard it is. But I would also encourage the reader, from my very own experience, not to give up or to despair because God always uses our pain for a greater purpose. While you may not see it when you are in the midst of the trial, you’ll be able to look back and see how God used our painful circumstances for good and for His glory. Cheryl: How have your own profound times of grieving equipped you to minister to others? Dr. Michelle: My own periods of grief, as well as the other life trials such as my family member’s cancer and my own experience with depression, have allowed me to minister to others from a place of “Me, too.” I don’t just say I understand, I really do because I’ve walked it myself. Sometimes it can be difficult to relate to others’ suffering when we haven’t suffered, but because I’ve had so much suffering in my life, I do understand, and I have a much greater degree of compassion and empathy than I ever thought possible. Cheryl: I have gleaned so much encouragement from your sermon at Embassy City Church because I believe depression is a subject that is grossly overlooked, downplayed, and disqualified in Christian circles. So many believe that Christians should never feel down and discouraged, and we are often shamed for finding ourselves in the throes of depression. It is real, and it is a fact that we, as Christians, are not exempt. I want to personally thank you for validating that fact and for highlighting it in your ministry. How can we change the culture and show more compassion to our brothers and sisters in Christ who are struggling and who have been wounded and shamed by those who should have encouraged them most? Dr. Michelle: Preaching about the hope we are afforded because of Jesus and His shed blood on the cross is one of my most favorite things to do. If I could do that full-time, I probably would. Unfortunately, too many churches do not address the difficult issues such as depression and anxiety within the Christian community, or when they do it is in an unsupportive and uneducated way. By 2020, depression is going to be our greatest epidemic worldwide, and anxiety is already one of our most common mental health ailments. We cannot ignore it, and we must get equipped to deal with it from a compassionate, Biblical perspective. In order to change the culture, we have to be willing to get educated and to not turn a blind eye to those who are suffering simply because it’s a hard issue. Part of that education is through resources such as my book and Bible study, and allowing us to address it publicly within the church body, such as Embassy City Church or The Summit Church did when they invited me to preach on the topic. Stigma continues because of a lack of understanding and education. We can’t shame people with issues like depression or anxiety, any more than we would someone with cancer or diabetes. And we have to remember that guilt, shame and condemnation are not from God, so why do we think it’s okay to do that to others? Cheryl: As Christians, how can we overcome anxiety? 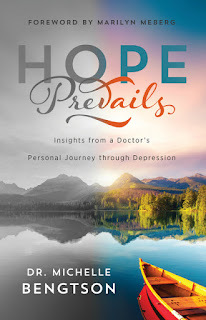 Dr. Michelle: First, it’s important to recognize that according to 2 Timothy 1:7, that “God has not given us a spirit of fear, but of power, love, and a sound mind.” How we overcome anxiety is very much in the same way that I outline overcoming depression in my book “Hope Prevails.” While medication is at times helpful, and so is counseling/therapy, a balanced diet, sufficient rest, and regular physical exercise, the Lord showed me during my own crisis with depression, and to a lesser extent anxiety, that unless we recognize and address the spiritual root of disease, it’s like putting a band-aid on an infection and expecting it to get well. We must recognize, consistent with John 10:10 and Ephesians 6:12 that we really do have an enemy who is out to steal, kill, and destroy from us. 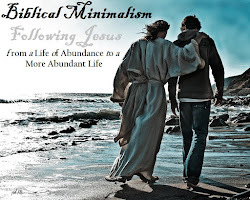 Additionally, we have to be willing to do the hard work, which largely involves “taking every thought captive and bringing it into obedience to Christ Jesus.” (2 Corinthians 10:5) This means we have to pay attention to the thoughts we have, recognize whether or not they line up with Scripture, and when we realize they don’t (often because we’ve believed a lie from the enemy), we have to refute it with the truth of God’s word. Cheryl: Please share with us about the books you have authored and co-authored. What is the story behind your book, "Hope Prevails?" Dr. Michelle: I was a contributing author to four books before I felt God’s leading to write my own book. In one I shared about how to overcome after hitting rock bottom. In another, I shared about a time when I experienced glimpses of God’s grace. In another, I shared my personal testimony. And in another, I talked about my approach to entrepreneurship. At that time, my story really amounted to the fact that my mother had been depressed my entire childhood, as had her sister and her mother, and at that point, I had gone through a rough spell of post-partum depression after the birth of our first child. But when God put that on my heart, I didn’t think my story would make that much of a difference because I didn’t think it was that significant compared to the suffering I saw my patients go through. Two weeks to the day after I told God I would write the book and share my story, I became deathly ill. So ill in fact that I was on bedrest for 5 months, dropped from 113 pounds to a skeletal 74 pounds, and was bruised over much of my body. When the illness kept getting worse rather than better, I wasn’t sure I wanted to continue living, and I plunged into a very severe depression (remember, that was AFTER I told God I’d write the book and would share my story). I had always thought that as the doctor I should be immune because I had the answers. Little did I know that I only had some of the answers. I tried everything I had suggested to my patients for 20 years (diet, exercise, therapy, medication, etc.) and those things helped but they weren’t enough to eradicate the depression. I cried out to God and told Him that I couldn’t go back to being a doctor unless He showed me what the missing piece was, because I wouldn’t tell patients to do something unless I knew it worked. It was then that He began showing me the importance of addressing the spiritual components of disease, in addition to the physical, cognitive, mental, and emotional. “Hope Prevails” has since won the Christian Literary Awards Reader’s Choice Award for nonfiction. The Bible Study released about a year after the original book and was specifically written in response to reader requests. In fact, I initially said “No, I don’t write Bible Studies. I’m not Beth Moore or Priscilla Shirer” but God got a hold of my heart and impressed upon me that while I may not write Bible studies, He does and if I would do it in obedience to Him, He would help me. Cheryl: How do you find inspiration to write? Is there a particular place or setting that you prefer as a writing environment? Dr. Michelle: God inspires my writing. I often get inspiration through nature, through songs or sermons, or from my quiet time Bible reading. I often write in my bedroom for things like blog posts or articles, but when I have to write a major project like a book, I do best if I can get away for several days with no distractions and just write and write and write. Cheryl: As a woman of God, wife, mother, doctor, speaker, author, and minister, how do you find a sense of balance? How do you keep your priorities front and center? What advice can you offer to those who wear many hats and struggle? Dr. Michelle: Honestly, until I became deathly ill several years ago, my life was completely out of balance. I took the weight of the world on my shoulders and I worked extremely hard (often more than 100 hours a week with only a couple hours at home to shower and nap before going back to the office). But the thing was, God never called me to do that. I took it on myself, largely because of the inner vows I had made when my father died. When I became ill, God showed me that He never asked me to work that hard and that He wouldn’t love me anymore if I did, and He wouldn’t love me any less if I didn’t. That was a life-changer for me. Now I spend more time at home and am there when my children get home from school. I regularly take time away to rest and renew my spirit and my physical body. And I pray and ask God what He wants me to accomplish in a day. For those who wear many hats and struggle, I’d suggest taking an honest appraisal of why they do what they do, and what they can dispense with. As women (and men), we put a lot of pressure on ourselves to be all things to all people, and to keep up with what others are doing, when in reality, God didn’t call all of us to do what He has called others to do. Prayer, and seeking God’s will for us is essential. Scripture says many are the plans of man, but it is God who orders their steps. 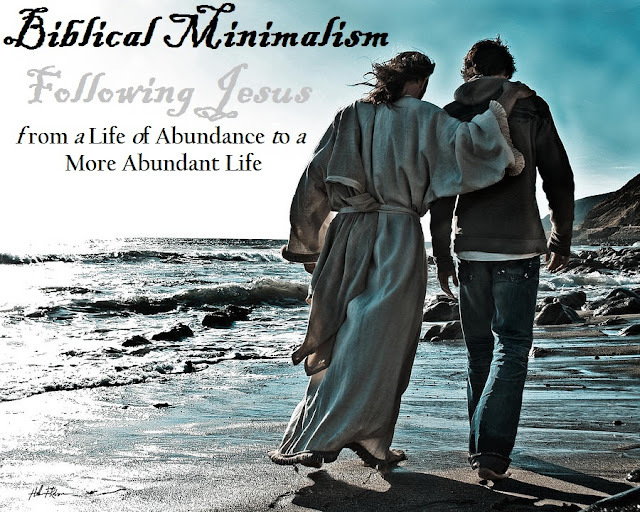 Essentially, we get ourselves caught in the doing mode, when we should follow Jesus’s example. He had only three years to do everything He needed to do in His ministry, yet He never ran and was never in a hurry. In fact, He said that He only did what His Father in Heaven told Him to do. That is the perfect role model for each of us. Cheryl: As you meet one-on-one with patients and also travel from place to place to speak, what would you say are some of the most overwhelming challenges we, as Christian face today? Dr. Michelle: One of the biggest challenges we face is the “Fear of Missing Out.” That often drives us to do much more than God ever desired for us to do. A second challenge is not to succumb to the trap of comparison. Comparison steals our joy and takes our focus off what God is doing for us, in us, and through us. Third, I think we often struggle to completely trust God in everything and for everything, and a lack of total and complete trust breeds anxiety, fear, and depression. Cheryl: What do you identify as being some of the most important things we can do to best position ourselves to not only face but overcome these challenges that are unique to this era of time? How can we be "more than conquerors" in the midst of a culture that is becoming increasingly hostile toward God and Christianity? Dr. Michelle: One of the most important things we can do is to get and stay rooted in God’s word. God has already given us everything we need for life and godliness. It’s our job to trust that and stand on His promises. The Bible promises that we will all experience trials, but it goes on to say that we also have the victory because Jesus already overcame the world and defeated death on our behalf. The second most crucial thing we can do is to take every thought captive and be vigilant about refuting the lies of the enemy with God’s truth. We have the Holy Spirit to remind us of all truth, but He can only remind us of the truth we know. Scripture says that God’s people will perish because of lack of knowledge. So we must be knowledgeable about what Scripture does and does not say, and be willing to call out anything that isn’t true. 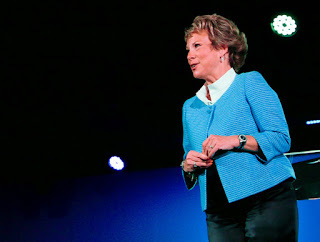 Cheryl: What advice can you offer us concerning self-esteem and recognizing our true identity as children of the King? Dr. Michelle: I think part of the problem begins with the term “self-esteem.” That suggests that our worth, our value, our esteem is our own responsibility and the result of what we do or don’t do. When in truth, our worth, value, and esteem come not because of who we are but because of whose we are. The worth or value of something is dependent on the price paid for it. Jesus paid the price of His life for us. No one before or since has done that, so Jesus is the only one who can speak to our worth and value, and he declared in John 3:16 and through His shed blood on the cross that we are worthy! Honestly, while I grew up in the church, attended every time the doors were open, and won Bible drills in Sunday School, it wasn’t until I was a mature adult that I came to really know what the Bible said about me and what God truly thinks of me. That only comes from digging in and studying His word and asking the hard questions. For three years straight I prayed every day that God would help me understand His true perspective of me and that He would replace my opinion of myself with His opinion of me. That has made all the difference in my life. Now my most important role is that of Daughter of the Most High God. Anything else is secondary and less important. Cheryl: When you are feeling overwhelmed or struggling with anxiety, depression, or spiritual discouragement, where are you most likely to turn? What are your favorite Scriptures, songs, books, and other sources of encouragement in times of despair? Dr. Michelle: I run straight to the only source of truth, and the only one who heals: God Himself. I read Scripture, I listen to praise and worship music, and I seek prayer from my trusted inner circle who will speak life over me and reveal when they pick up that I might be believing the enemy’s lies instead of God’s truth. In my book, “Hope Prevails” and the companion “Hope Prevails Bible Study,” I give a prescription at the end of every chapter that is filled with key scripture to memorize. I also give a prayer for the reader who is going through anxiety, depression, or spiritual discouragement, and I offer a suggested playlist of praise and worship music that has helped me most when I needed it. 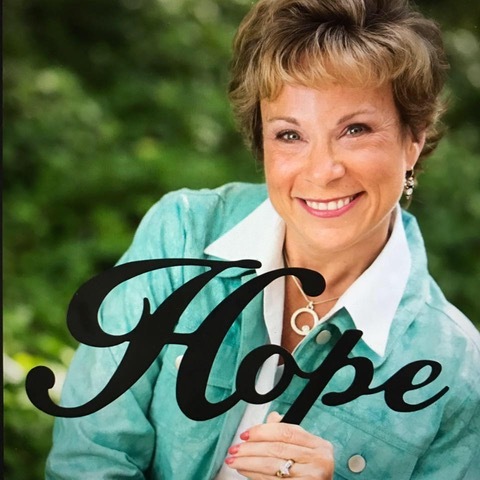 Dr. Michelle: My desire is to continually share God’s help, hope, and healing with others. I would appreciate prayers for more open doors for ministry to speak, teach, preach, and share His truths, as well as prayers for God’s words as I continue to write the next book (and the next, and the next…). Pray for protection and safety from the enemy’s attacks on me and my family because I have found that often when we step out and do big things for God, it gets the enemy angry and the attacks often become more intense. Dr. Michelle Bengtson (Ph.D., Nova Southeastern University) is an international speaker, and the author of the bestselling “Hope Prevails: Insights From A Doctor's Personal Journey Through Depression” and the newly released companion “Hope Prevails Bible Study.” She has been a neuropsychologist for more than twenty years, and is now in private practice in Southlake, Texas where she evaluates, diagnoses, and treats children and adults with a variety of medical and mental health disorders. This doctor knows pain and despair firsthand and combines her professional expertise and personal experience with her faith to address her patients’ issues, both for those who suffer and the ones who care for them. Using sound practical tools, she affirms worth and encourages faith. Dr. Bengtson offers hope as a key to unlock joy and relief—even in the middle of the storm. 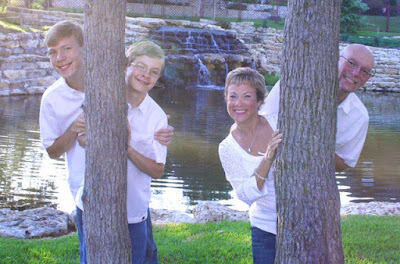 She and her husband of thirty years have two teenage sons and reside in the Dallas/Ft. Worth area. She blogs regularly on her own site: Dr. Michelle Bengtson. I cannot begin to say how much it helped me in my personal battles. "Our feelings are only the outward manifestation of the thoughts we believe." Thank you, Dr. Michelle, for your time and participation in Inner Views. We so appreciate your presence here and thank you for all you do!